Reader Question: Is Shopsmith Band Saw Worth It? 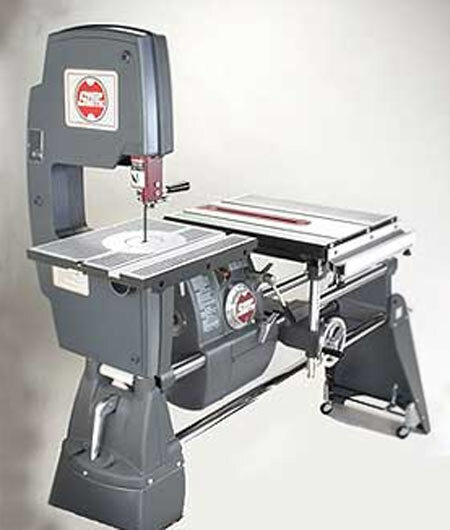 Reader Mike is in the market for a Shopsmith band saw, and he asked us how we like it. It’s a great question, and some folks have already rung in on this one in the positive. I might be a little biased, but I’d say if your Shopsmith was made in the last 30 years and you want a band saw, it’s a no-brainer. The saw features a 6″ depth of cut; the table tilts 5 degrees left and 45 degrees right; and the blade spins from 700 to 1,050 RPM. As others have said, you’ll have to tune it and spend a minute or two setting it up, but it’s a small price to pay as far as I’m concerned. Retail price is in the neighborhood of $500 — but the one I just started running in the shop is on its third decade, and it doesn’t have a single issue. 14 Responses to Reader Question: Is Shopsmith Band Saw Worth It? I’m kicking myself for not buying the Mark V Shopsmith that was sold at the same auction when we bought our house. My grandpa had one, and growing up, I can remember doing lots of my first projects with that thing. Yes, the bandsaw was there. Now that I’m a little older, I see a few downsides to this attachment. Mainly, the inability to add a riser block for resawing, and the 11″ throat might be a little small for that one time you need it. You can get a decent Ridgid or Delta for the same price, and they’ll have a 14″ throat, and be able to accept a riser block. I’ve never used one, but getting a stand alone bandsaw seems like a better idea. You can get a bigger one for the same price, and then you have more flexibility with it as a standalone unit. I have a Shopsmith Mark V, made the year I was born (1956). My dad had it forever. He got a bandsaw more than 30 years old – and it’s pretty good. The only think I don’t like about it is the way you adjust the top wheel – you grab it at the top and at the bottom, and twist it, to align it. There should be an adjustment knob on it (on the outside, on the back – that would be best) that can mechanically make that adjustment. This minor inconvenience, thankfully, doesn’t happen very often (I’ve only had to do it once since I have had the machine). The need for this adjustment can be eliminated (except initially, I suppose – it has to get set up correctly at least the first time), by loosening the tension on the band saw blade when it isn’t in use. I just relax the tension on it by backing off the tensioner by three complete turns of the tension adjustment bolt. Just DONT FORGET to re-adjust it before using it the next time. It is a very well built unit, and cuts true all the time – and the ability to adjust the speed without moving belts onto other pulleys is a great benefit. If space is the issue, maybe. Certainly you can buy a stand alone unit with more capacity for the same amount of cash, or far less if you check out your local Craigslist and buy used. Craigslist is a great place to pick up tools if you know what you doing. I just picked up a like new Grizzly shaper with 6 cutters for about $ 50 more than the cutters alone were worth. i’ll second the craigslist avenue. i picked up a early 70s craftsman band saw for $100 a while back. all it needed was a new blade to work. if i wasn’t converting it to a metal saw i’d be using it now. The Shopsmith is a good deal for people who have limited space and/or limited need for the tools, or even just starting out. That’s just me though. My friend, who has a shop twice as big as mine, just bought another Shopsmith to use in his shop. He likes them and uses his constantly while he’s working in his shop. Concerning resawing – Incra guides attach easily to this saw to resaw as thin as needed to make veneer. I have had a Shopsmith Bandsaw for nearly twenty years. It is virtually maintenance free and works like a charm. Occasionally lubrication, frequent cleaning (air hose for me) and a waxed table is all that is required. I have now acquired a 2nd one which will likely end up with one of the grand kids. I would recommend this band saw to anyone setting up anything less than a full up professional wood shop. I’ll third the craigslist avenue. It can be a good way to get used or almost brand new tools including used Shopsmiths and as Kurt says if you know what you are doing. I have seen some Shopsmith Mark V as low as 600-800 including a band saw. It may be used but if you are lucky you may end up with the same or similar model and have some good interchangeable spare parts. Here’s one for $750 off of Craiglist with a bandsaw just posted today. Thanks for the post about this! I think I’ll start looking for one. I’ve seen them around 150 on ebay. Icant find anyone selling just the bandsaw on craigslist, so it might take a while to find one. @Chuck Wright: I’m thinking more about resawing pieces that are thicker than 6″ than controlling the thickness of the cut. Again, not something that’s done every day, but for the price of the attachment, it’s something that you’d kick yourself for – the one time you need it. What is the distance between the lower wheel hub and bearing on the shopsmith bandsaw.. I have mine off to put a new tire on and measured it and mine is 1/4 inch from hub to bearing.